This is your final stop on your tour. It includes movie clips, music, and pictures you can download. After you explore here, you will end up back at my Fargo home page, where there are many links to get you started on more bleak and dreary roads. Thanks for driving out now towards Brainerd and Fargo. Glad ya came out, ok now, you betcha. This is the complete script you just read. It contains all of the lines, etc. in an easy to read format. Won't take long, but you need NotePad to read it. 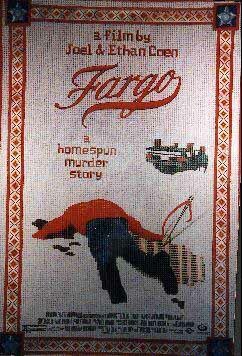 fargo1.wav This is the main theme song music that plays at the beginning of the movie. It is composed by Carter Burwell. I recorded it. poster.jpg - The movie poster for Fargo. If you go here, you can download some memorable parts of the movie. They are definitely worth the download. These are all downloadable features. The pictures were the ones you may have seen around my Fargo web pages. If there are any problems downloading anything, please, let me know.